One of the joys of preserving my own food is having delicious, locally grown summer fruits year-round. But as wonderful as traditional fruit preserving methods are, I can only eat so much jam. So I also pickle some of my blueberries, mulberries, cherries, strawberries, peaches, and other summer fruits. Pickling is an incredibly easy, safe, and, it turns out, delicious way to preserve fruit. Plus, in addition to the tasty orbs of fruit, you also create flavorful liquids that are perfect for adding to homemade cocktails or sodas. Everything in the jar has a purpose. This blueberry pickle recipe uses traditional warming spices and red wine vinegar, which give the fruit and liquid a rich, earthy flavor. The pickled berries and liquid can be used on ice cream, in pancakes and muffins, or with a cheese board. 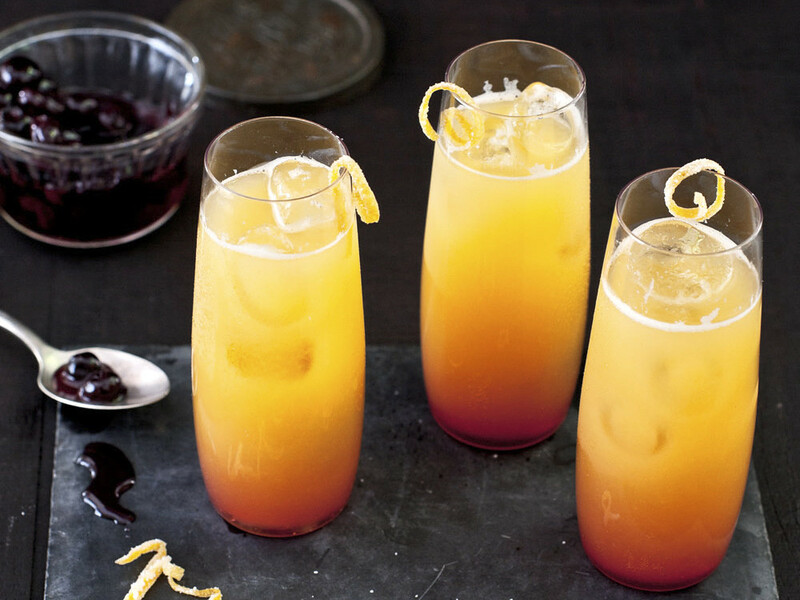 They can also be used to make blue sunrise cocktails, a twist on the classic mimosa. Enjoy as a refreshing drink right now or in the dead of winter as a tasty reminder of summer’s bounty. Note: You will need two one-pint jars and some cheesecloth. Tie cinnamon stick, cloves, and allspice into a piece of cheesecloth. In a medium saucepan, bring vinegar, sugar, salt, vanilla, and spice bag to a boil, stirring to dissolve sugar. Reduce heat, cover the pan, and simmer for 10 minutes. Meanwhile, pack one cup of blueberries into each pint jar. If canning, process jarred blueberries in a hot water bath for 10 minutes. Otherwise, cover jars with a loose lid and allow to cool before refrigerating. Pickled fruit will keep in the refrigerator for about year. Blueberries and their liquid will taste best if you can allow them to sit for a day or two before eating. In a Collins glass, stir blueberry pickle liquid, elderflower liqueur, and orange juice together with ice. Top with champagne. Garnish with pickled blueberries and candied orange peel. Michaela Hayes will be teaching Fruit Pickling: Sodas and Cocktails and Kimchi: When Fermentation Gets Spicy at BBG later this month. Michaela Hayes is the founder of Crock & Jar, a preservation company with a mission to allow everyone to buy more local food in season and preserve it in order to eat locally year round. Blueberries and other summer fruits are delicious pickled and can be used in cocktails, sodas, and other recipes. Photo by Moya McAllister. Food Styling by Michaela Hayes.